Israeli protected areas seem doomed to be the latest environmental victim of the ongoing conflict. A fire caused by a Palestinian incendiary device is extinguished, June 27th 2018. The 8th July marked 100 days since the first homemade incendiary kites were launched over Israel from Gaza. It also saw Israel promising punitive measures against Gaza in retaliation. As tensions continue to escalate, this blogs looks at the impact of Palestinian incendiary kites on the environment. On March 30th Palestinian activists launched what were planned as six weeks of protests under the banner of the Great Return March. Protest camps were established at five points along the border with Israel and the subsequent weeks would see appalling levels of bloodshed as the Israeli Defence Forces and border guards opened fire on protestors. The tensions stoked by the US’s decision to move its embassy to Jerusalem later escalated into Israeli airstrikes and Hamas rocket launches. The day the protest began would also see the emergence of the use of homemade incendiary devices by Palestinian protestors. Simple kites and balloons with a burning coal or accelerant, the low tech weapons have proved difficult to stop and their use has since become a near daily occurrence, on July 7th alone, 17 fires were claimed to have been started in areas adjacent to the Gaza border. At the time of writing, Israel says it has stopped 670 of them, primarily through the use of drones, although deploying a laser based system has also been discussed. As with much else in the conflict the total number of kites launched is disputed. Since March, Israel has also retaliated with air strikes, which in turn have triggered retaliatory rocket launches from Hamas. Israel has stated that its airstrikes have targeted the security infrastructure used by Hamas, rather than the kite flyers themselves – which they have said would cause too many casualties and risk further escalation. With Israel unable to stop the kites, pressure has been mounting on the government to take a stronger stand against Hamas. Prime Minister Benjamin Netanyahu has now announced the closure of the Kerem Shalom border crossing, which serves as the main entry point for commercial goods and humanitarian aid into Gaza. Imports of aid, food and medicine will now require permission from the military, and in a further move, Israel will prematurely end an extension of the permitted Gaza fishing zone. Both policies seem likely to lead to a further deterioration in living conditions in Gaza, which has already been dealing with the consequences of the long-running Israeli blockade. Further unspecified measures have been promised by the Netanyahu government. The kites have caused fires in agricultural and protected areas adjacent to the Gaza border. Precise figures on the number of fires are hard to come by and it is likely that fires caused by other factors, whether natural or manmade, will have been attributed to the kites. Harel Dan, GIS Coordinator at HaMaarag – Israel’s National Nature Assessment Programme – has been collating open data from media reports, drones and satellite images to map the fires since May. His data reveal that, while the majority of fires are concentrated within 4km of the border, incidents have occurred up to 12km away, and that by the end of June, burn scars could be identified covering 22km2. Screengrab from Harel Dan's open source map of burn scars from the fires. The cost of damage to border farms has been estimated at nearly US$2m, which includes the loss of income from crops and damage to irrigation systems. Israeli communities have also raised fears over air pollution from the fires, suggesting that asthma rates are higher in children than would normally be expected. In response, the Israeli ministry of environmental protection has sited a mobile air monitoring station nearby to gather data on PM2.5, NOx and NO2 emissions. On June 2nd, concerns were raised over a fire that had been started 3km away from an oil storage depot at Ashkelon, and with it the risk of a serious incident. 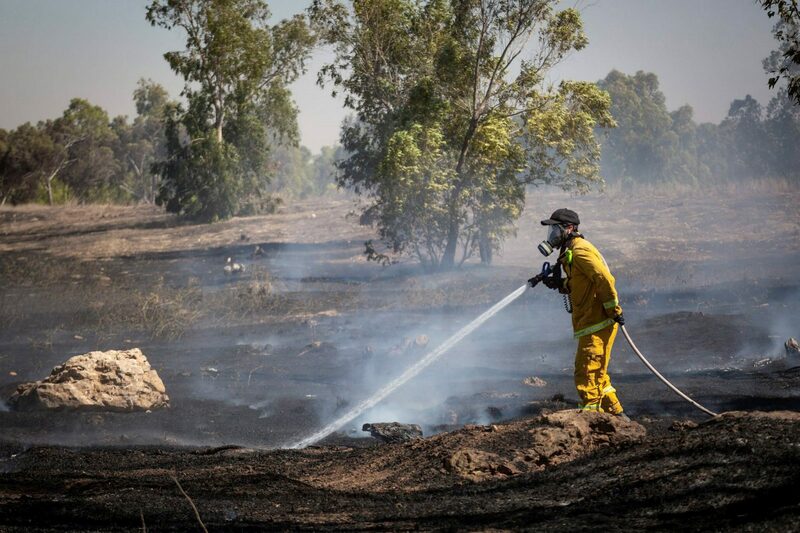 Responding to the fires has required the deployment of firefighters from across Israel. While agricultural areas affected by the fires are likely to quickly recover, there is more concern for the fauna and flora of the protected areas close to the border. Israel’s Parks and Nature Reserves Authority has reported that 10,000 dunams (10km2) of conservation areas have been affected. While much of the plant life may return next season, they fear that ecosystems in the protected areas will take much longer to recover. Of particular concern are animals that have been unable to escape the fires, larger species such as foxes, jackals and porcupines have reportedly been killed, as well as smaller species of rodents, reptiles including tortoises, snakes and lizards, and insects. The first protected area to be affected was the Be’eri Crater Nature Reserve in May, and satellite imagery shows multiple incidents during the month, which continued into June. As it is only 2km from the border it has been at particular risk from the kites. The habitats in the reserve are nationally rare and its species composition unusual as a result. In June fires thought to have been caused by a kite affected 75 acres of the 245 acre Kariyya (Carmia) Nature Reserve to the north of Gaza. The reserve is home to a number of endangered plant species and rare mammals and birds. The previous month, fires had raged at the HaBesor Stream Nature Reserve, affecting 3,000 acres. False colour timelapse of fire damaged areas in the Be'eri Crater Nature Reserve between May and June. Created using the ESA's Sentinel Hub. This year’s escalating tensions seem unlikely to be addressed by the policies proposed by the Netanyahu government, reflecting as they do the deteriorating living conditions in Gaza, and the Trump administration’s new policies towards the conflict. In that respect it seems inevitable that the Palestinian practice of using indiscriminate incendiary kites will continue. With no end to the fires in sight, it would appear that the protected areas adjacent to Gaza will need to be added to the growing list of environmental components degraded by the conflict, which now includes groundwater resources, soils and agricultural land and the coastal marine ecosystem.